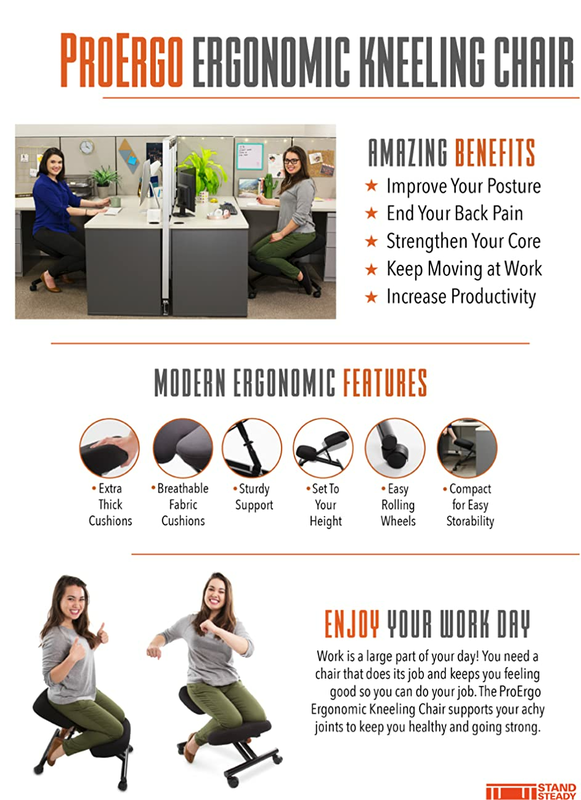 Stand Steady's ProErgo Ergonomic Kneeling Chair - Adjustable Height - Perfect for Relieving Neck and Back Pain & Improving Posture - Great Fit for Your Home, Office, or Classroom. RELIEVE NECK AND BACK PAIN: Our kneeling chair offers three different height settings so you can customize it to fit you. It is designed to naturally correct your posture, and helps with blood circulation while also relieving any neck or back pain. MAXIMUM COMFORT: We’ve got your back (and your knees, shins, and your behind!) Your ergonomic kneeling chair is equipped with a mesh thick three-inch cushion to ensure all day cool comfort. It is equipped with 4 casters (wheels) to enable you the ability to keep moving – just like your old office chair! STURDY: The ProErgo Ergonomic kneeling stool is designed with a strong metal base so its constructed to last and last. Your new rolling kneeling chair supports up to 250 lbs. TRENDY: With a sleek all black style – your new kneeling stool is perfect fit for your home, office, classroom, or anywhere you need a little extra support! WATCH OUR VIDEO: Instead of telling you – we’d rather show you! Check out our video in the pictures section. I picked this one based on reviews. It didn’t disappoint. I was relieved since these chairs do have a lot of criticisms. I am a therapist with back pain exacerbated by sitting. Not a good mix. This chair definitely helps. I am 5”5 and it is fine for me. It sits lower than I expected so when I do computer work, I had to rig it a bit to align things properly. I plan to get a second one. Its a vast improvement over traditional chairs. Easy to assemble, seems sturdy but isn't too heavy. The wheels can be a little stiff. Comfortable for both a 5'4" person and a 6'1" person. A really solid kneeling chair! The two possible height settings seem optimal for most regular desks. Unfortunately I can't use it for more than a couple of hours at a time because I have joint/knee problems, but it is a nice break from my old office chair. I don't usually have time to write reviews, however, in this case it is very warranted. I had a 7 level spinal fusion and have struggled since then to find a chair - any chair - that wasn't uncomfortable, without any luck until I bought this chair. I found this chair and thought it would be another waste of time but boy was I WRONG. I am able to work without back pain. It takes a few days for your shins to get used to it and if you sit correctly your behind should really hold most of the weight. This is the best chair for anyone who has back pain and even those who don't because it will improve your posture ! It's worth every penny ! It is not a seat to use all day. Good to switch with a regular chair few times a day to give your back a break and improve posture. Since this chair shifts body weight to your knees, it can put strain on weak or arthritic knees. I felt a little stiff in my knees when I used it for more than an hour or two. Otherwise, I like it. It was easy to assemble also. Great quality chair that helps to relieve back pain. Takes the stress from your back and relocates it to your shins. Helps you to sit upright in more of an ergonomic position. I am a big guy, 5'11" 240lbs. Works great.